The Sperry Beacon Tower. Image 06337 courtesy of the Royal BC Museum. Opening January 1, 1931, the eighty-foot Sperry Beacon Tower was topped, at that time, by a ten million candlepower arc lamp searchlight. 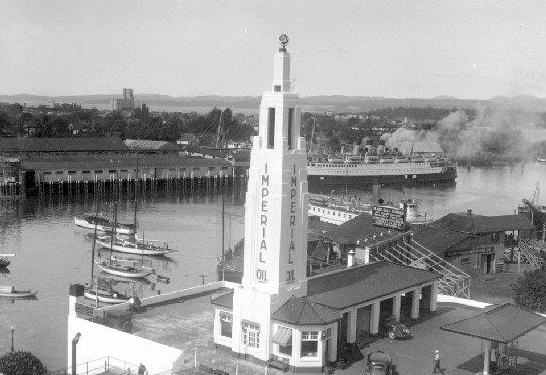 At the corner of Wharf and Government Streets, it was the central feature of a new Imperial Oil automotive service station. Erected in anticipation of increasing seaplane traffic into the inner and outer harbours, the direct model for the Causeway Tower and Beacon was the two billion candlepower Lindbergh Beacon that topped the Palmolive Building in Chicago. Dedicated in 1930, by its inventor, Elmer A. Sperry, his beacon would mark the new night airmail routes. This was also the beginning of the era of the Pan-American flying boats. The first of these 'Clippers', the Sikorsky S-40, was introduced in 1931. Victoria wanted to be ready for this new air-age. Image 06338 courtesy of the Royal BC Museum. In 1907 there were 6000 cars in Canada. By 1917 there were more than 260,000. British Columbia experienced a similar increase in the motor car. Ontario's Imperial Oil Company was massively expanding operations in British Columbia to service the demands of these automobiles. 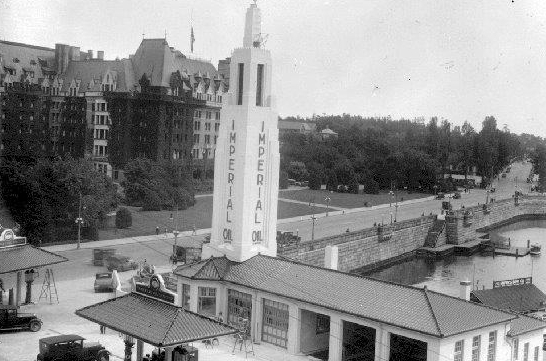 The flagship 'Causeway Tower and Garage', was opened by Imperial Oil on the north shore of the Inner Harbour in 1931. Designed by Vancouver architectural firm, Townley & Matheson, noted designers who later created Vancouver City Hall, the entire structure was developed by that office, including the Sperry Beacon tower. 'Imperial Oil' was emblazoned up the four white sides of the tower, leading to the common designation, 'Imperial Oil Tower.' It was to be the first of a string of Victoria area service stations. The garage and tower were designed in the 'Art Deco' style, common in North American cities in the 1930s. A natural geological formation in the harbour was taken advantage of in the structure's design. An escarpment comes to the surface along the harbour's Wharf Street shore. The escarpment consists of two giant steps from the water to the street. In its Description of Historic Places the Register of Historic Places states, "The Causeway Tower & Garage consists of a reinforced concrete structure located on the north side of Victoria's Inner Harbour, built into a natural escarpment. The lower two storeys are exposed and face the water to the south and are below street level. A one-storey pavilion stands at street level, capped by a soaring Art Deco tower." In the British Columbia Archives the escarpment can be seen in photos from 1890, 1906 and 1910, all previous to the tower's construction. In the service station period, the gas pumps were off the street by the pavilion, at the corner of Wharf and Government. A ramp, wide enough for two vehicles abreast, ran from the Wharf Street level west of the pumps to the huge shop portion of the station built on the escarpment's first step down. There were repair stations for 120 cars in the shop area. The light from the large south-facing windows gave excellent illumination for the work being done. Image 06339 courtesy of the Royal BC Museum. Continuing down to the shore level, the ramp gave access to the marine service facilities located on that level of the escarpment, at the water's edge. The wharf for the Black Ball ferry to Seattle and Port Angeles was later situated at this location. During World War II, when blackout prevailed, the tower's beacon was turned off. In 2009 the light was refurbished and again shines nightly. Clock-faces have been added for the benefit of passersby below. The service station operated until 1974. In 1975 the Province of British Columbia acquired the building. 1978 saw the Provincial Capital Commission take it over, spearheading the restoration work done. The PCC, which funded itself through rental revenues, spent $300,000 on seismic upgrade, maintenance and restoration on 812 Wharf Street beginning in 2006. This included: a new wheelchair accessible lift, Sperry Beacon restoration, seismic upgrade (clock tower), roof replacement, and exterior painting. The PCC was dissolved in 2013, leaving the Provincial Government as landlord for the Wharf Street property. Today the structure belongs to the City of Victoria. The Victoria Visitor Information Centre is located in the street-level pavilion. The mechanical shop level now holds Milestones Restaurant. The only things left from the shop era are the large windows overlooking the Inner Harbour, providing a spectacular view for diners. Access to the restaurant is made by a stairway or lift from the pavilion level. The auto ramp, closed to regular access, goes to the shore-level. Public access to that level is by the staircase and lift. Various shops are now located in the shore-level of the building. "812 Wharf Street", Provincial Capital Commission, 2013; "Causeway Tower & Garage", Canada's Historic Places, 2013; "1931 Victoria City Directory", Vancouver Pulic Library, 1931; "The Flying Boat Airliner", clipperflyingboats.com, 2012; "Black Ball History", Black Ball Ferry Line, 2013; BC Archives Photographic Records, "e-02167, 1890, f-09642, 1906, d-01291 1910, i-68385 1927,f-06337, f-06338, f-06339, 1931, i-02128, 1946,"; Times-Colonist, "Provincial Capital Commission dissolved in money-saving move," Rob Shaw and Bill Cleverley, November 19, 2013.